Bring your adult Anakin Skywalker costume to completion when you add this Anakin Skywalker gauntlet. The glove is made out of a brown nylon material, but looks like shiny leather. Three metal buckles at the wrist replicate the look of the one worn by Anakin himself. 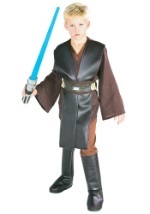 This authentic Star Wars costume accessory is a great addition to any of our Anakin costumes.